Awesome job on your free choice pages!! It's always good to throw one of those in the mix because you obviously won't always have someone coming up with the prompts for you. As I mentioned before, I journal this way, almost every day. I have volumes and volumes filled with this style of journaling and almost all of my pages are "free choice" pages because I am doing them as they come to me!! I hope all of you attempt to keep your journaling going after this 30 day challenge too! Journal Prompt: Alright, today we are creating a Top 10 List. This Top 10 list can be of anything! This can be a Top 10 List that has already been established but that you want to document, or it can be a Top 10 list that you think up right this second!! 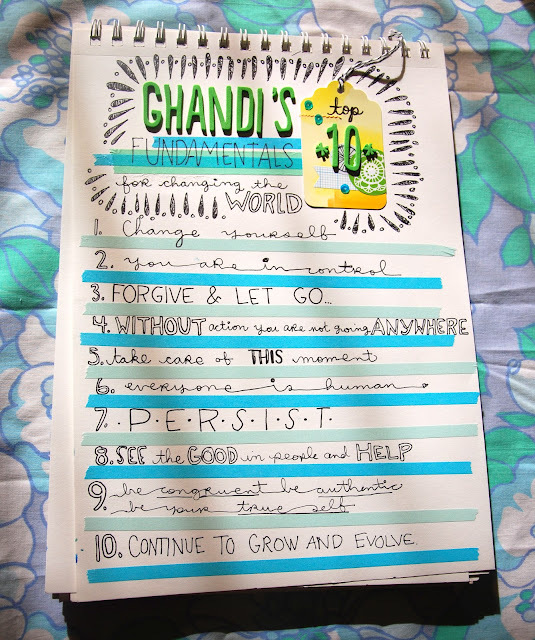 I am a huge fan of Ghandi and all of his peace-making ways. I have always loved his list of Fundamentals for Changing the World. I have wanted to right these down so that I could look back on them from time to time so I figured that this would be the perfect time to do just that! janel, it is perfect! you definitely informed me. i want to write those down for myself too. nice handwriting font too. :) happy sunday! Janel this is fantastic. I am a huge fan of Gandhi as well and love your page. I'm a day behind! How did this happen?! But that's okay ... I'm still in the game and loving every moment.